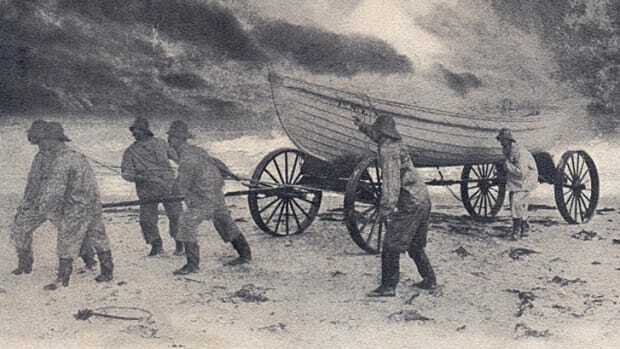 The “law of the sea” demands that you render assistance to a mariner in distress, and that time-honored mandate was fortunate for a trio of recreational boaters aboard a disabled 55-foot sailboat. Late last Thursday the container ship Bull Hunter told watchstanders at Coast Guard Sector Charleston, South Carolina, that a sailboat had lost its steering off the coast of Georgia’s St. Simons Island. The three people aboard were suffering from dehydration from seasickness because of heavy seas and winds in excess of 30 knots. Take a look at this quick clip of another efficient air rescue by the Coast Guard. The Coast Guard sent the Cutter Yellowfin, an 87-foot coastal patrol boat, to assist, but the crew was not able to safely launch its small boat. "During any evolution, safety is a top priority for the Coast Guard," said Lt. Cmdr. Shannon Scaff, chief of planning and readiness for Coast Guard Sector Charleston. "It&apos;s a factor that is constantly evaluated and re-evaluated as any operation proceeds. To make the necessary decisions to save a life, it&apos;s a matter of identifying and mitigating those inherent risks." At first light Friday an aircrew aboard an MH-60 Jayhawk helicopter from Air Station Clearwater, Florida, arrived, hoisted the three people aboard and took them to McKinnon St. Simons Island Airport. They were transferred to local paramedics.